Currently, we have business “change” models that are completely different from every known model of learning. The Knowledge Economy requires that we solve the needs of business and learning with a combined model. The Explanation Age “ADIIEA” model is the first strategic business model designed specifically to support a Learning Organization. The Explanation Age Method is based on the most basic (innate) steps taken which produce a lesson. Not a classroom lesson, but the story-telling pattern of learning. 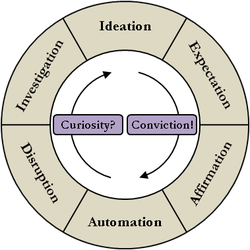 This Innate Lesson Cycle is the mind’s natural model for change and learning, and is formed by the relationship of our workability beliefs (Does Work, Won’t Work, and Could Work) and our response modes (Reactive, Reflective, and Questioning). 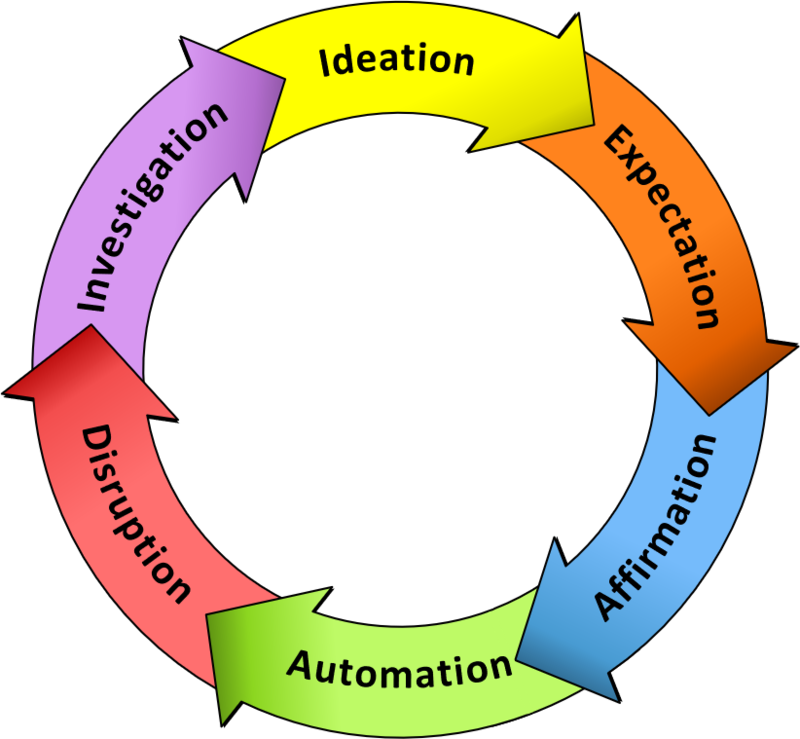 And this cycle contains six phases: Automation, Disruption, Investigation, Ideation, Expectation, and Affirmation, or simply called ADIIEA (pronounced uh-dee-uh). The location of each phase is like working against gravity; we tend to rest at the bottom and operate in automation, without much thought. 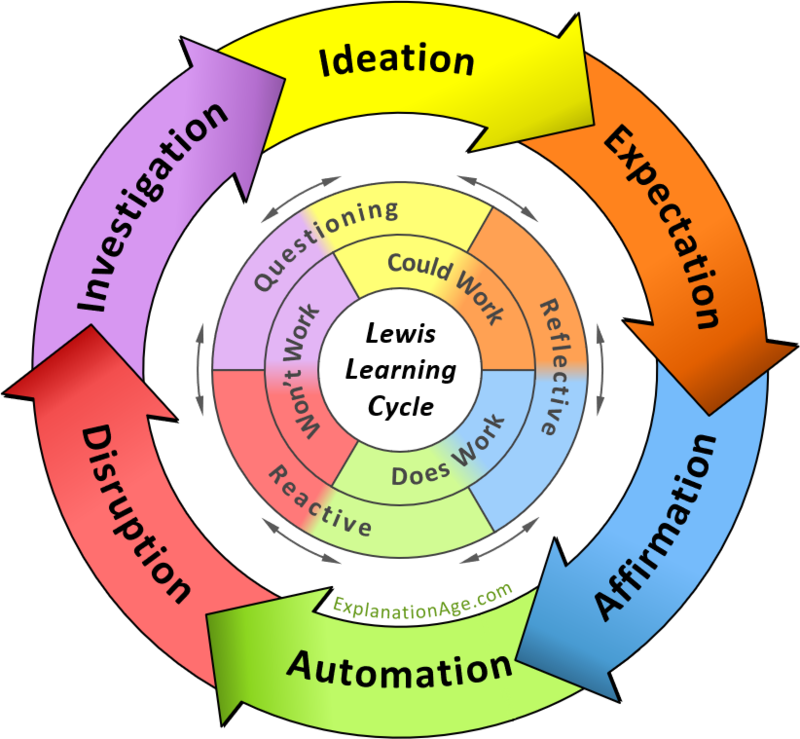 This cycle is at play within every business project, every classroom lesson with educational (not just instructional) objectives, and even for how a bill becomes a law. 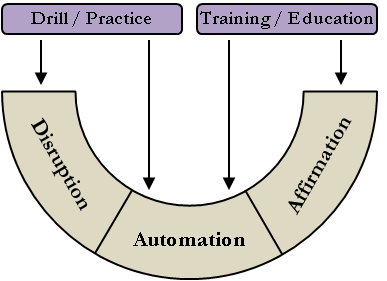 Automation is where we manage proficiency through Operations Management, and distinguish between simplicity and elegance. Disruption is where we manage preparedness through Risk Management, for problems as well as opportunities. Investigation is where we manage impartial analysis through Investigation Management, for inspections and explorations. Ideation is where we manage constructive ideas through Idea Management, and seek both derivations and innovations. Expectation is where we manage realistic goals through Change Management, and act on what we put our hope and faith in. Affirmation is where we manage certainty through Quality and Assurance Management, and distinguish between knowing and trusting. Methods from the last age were linear and prescriptive: Do-These-Steps-In-This-Order. ADIIEA is a method that is cyclic and descriptive. It provides the phases of thinking through a lesson, which allows for "rocking" between phases, but it begins and ends in our most natural state: automation. 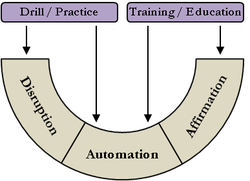 Oliver Wendell Holmes once said “I wouldn’t give a fig for the simplicity on this side of complexity, but I would give my right arm for the simplicity on the far side of complexity.” He was describing the elegance found only after knowing the options and choices considered from each lesson phase which leads to a state of proficient automation. Current business models are both linear and prescriptive. They give us steps to do without first providing the framework of the underlying model they are trying to affect. With the current focus that our corporations have with Six Sigma and DMAIC to create factory-like efficiencies, it may not be a coincidence that their ability to innovate has been decreasing. 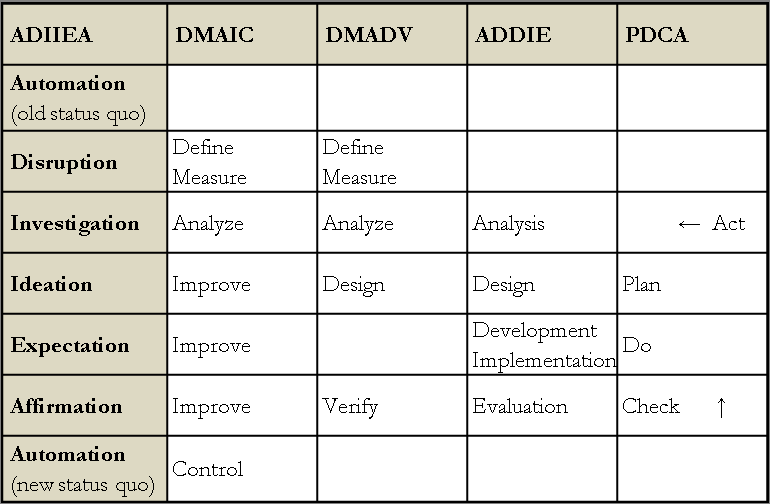 ADIIEA is a business model that is cyclic and descriptive. Each phase represents a mode of the mind. Currently, organizations treat project phases as simply boxes within the project management software, which can easily be collapsed to “save time.” But Ideation is a mode of the mind where the best ideas occur if the team were allowed to brainstorm without a narrow and pressured window of time to “start doing something.” This is the beginning point of why most projects fail. Traditional education is based on “half-pipe” instruction, which only supports half of our natural learning cycle. Have you ever wondered why the term “Drill & Practice” has two words? They are relative: the first time you have a fire drill, it is a drill - but the tenth time, it is practice. The term “Education & Training” works the same way: Here's what works, now you try it. Some learning is found in the memorization of what others describe as “Does Work.” But understanding is found in being able to complete the entire journey around the lesson cycle, rather than staying down in the half-pipe, or bottom half of the cycle. So, are you into “over the top” thinking, or just “half-pipe” thinking? In the Explanation Age, the learning methods will not focus on moving an individual or organization into the reactive state of Automation, but instead will focus on moving individuals and organizations into a continuous state of improvement. 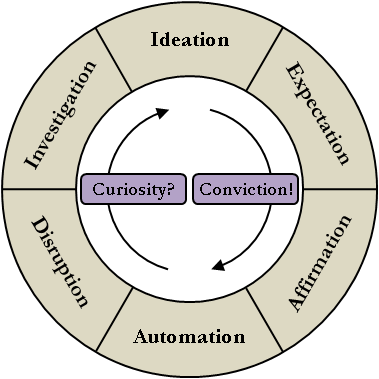 By understanding that project phases are formed by these 6 modes of the mind, Thought Leaders move their organizations into the Knowledge Economy with a focus on Questioning Skills, and a balance between curiosity and conviction within leadership competencies. Does your organization have a culture of Continuous Improvement? Take this free survey with only ten questions to find out. The Explanation Age is where business psychology catches up to the knowledge economy. This is where our natural ability to “explain” produces “sense-making” models that will replace the factory-driven “box-checking” models. This is where the need for understanding replaces the requirement of simply knowing. And this is where transparency is measured by the clarity of the “decisioning” process, rather than the number of documents placed online. The Explanation Age methods provide these needed models for the knowledge economy. The Information Age gave us the World Wide WHAT. The Explanation Age will give us the World Wide WHY. The underlying methods from the last age were created by reviewing the "systems" in place: these were the factories and classrooms seeking zero defects and maximum efficiency. The methods for the next age need to be created by reviewing another system: the system of explanations, which have a pattern and consistency that can be modeled and managed across organizations.